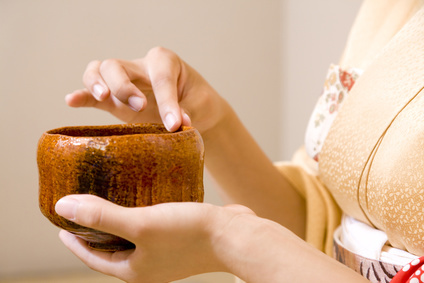 Let us introduce you the basic manners to enjoy the Japanese tea ceremony “Sadou”. There are many schools of Sadou, but here we will explain the manners based on Ura-Senke style. (1)Enter the room and having a seat. (2)Receive and eat the tea cake. (3)Receive and drink the tea. When entering the room, you must be careful not to step on the edge of the tatami flooring and the threshold. After entering the room, have a glance at the ornaments of the room such as the flowers, vases, and the hanging scrolls. 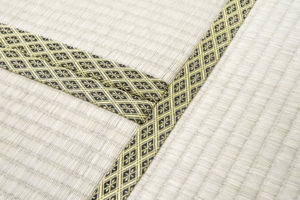 It is favorable to kneel down when looking, but make sure you are not stepping on the edge of the tatami. After taking your seat, bow once to the master or the ceremony, who will be serving the tea. When bowing, be on your knees and place your hands before your knees. Then lower your head slowly to bow. The edge if the tatami represents the status of that house, and stepping on it is against the manners. 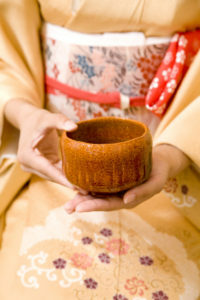 In a big tea ceremony, the tea cake might be served before the tea serving starts, or right after it starts. When the tea cake is served before you, bow once to the server. After the master gives his or her words to eat, hold the served plate both hands and bow slightly to show your appreciation and gratitude. Place the kaishi (a paper napkin) on your lap, and place the tea cake on it. If there is a chopstick, then use the chopstick to do so, otherwise use your hands. After placing the tea cake, wipe your chopstick or finger at the edge of the kaishi, and then pass the plate to the person next to you. When eating the tea cake, hold the kaishi and cut the tea cake in to small bite size with a skewer. It is said that by eating the tea cake before having the tea, the sweet taste of the cake brings out the tea’s flavor. Also this eases the stress to the stomach. Make sure to finish eating the cake before the tea is served, and put away the kaishi. The color and the design of the tea cake normally resembles the season which the ceremony is held, so enjoy the tea cake not only by its taste, but also by its beauty and colors. When the tea is served before you, bow once to the person who brought your tea. Place the tea between you and the person in the upper seat, and say “Oshouban itashimasu” which is the greeting word to have tea. Next, place the tea between you and the person next to you who his or her tea is still not served, and say “Osakini”, which means “Pardon me for having the tea before you”. Once your greetings are finished, place the tea before you, and say “Otemae choudai itashimasu”, which means “Thank you, now let me have the tea”. Place the teacup on your left palm, and place your right hand on the side of the cup and turn it 2 times clockwise. Then place your mouth to the cup and have a sip. Tea cups have beautiful colors and designs on one side, which is usually the front of the cup. When drinking, the cup is turned in order to avoid putting your lips on the front side of the cup. 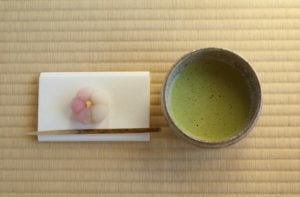 It is not against the manners of the tea ceremony to make a sound when you sip the last drop. When you finish drinking, wipe the rim of the cup with your right index finger and thumb, and then wipe your fingers with the kaishi. Then, turn the cup two times anti-clockwise, to bring the front side facing towards you. Finally, place the cup on the outer edge of the tatami. The tea cups design is arranged to match the season on which the ceremony is held, and it will entertain your eyes after you have finished drinking. When the tea ceremony is finished, bow once. There may be an opportunity to take a look at the tea sets, and if so, watch them by sitting and do not stand up when looking. If you did not have the chance to look at the ornaments inside the room, you may look at it before leaving the room. You do not have to rush to leave, take your time and enjoy the space of the tea ceremony. This is the basic routine of the tea ceremony. These manners are not a must so you do not need to worry if you cannot memorize it all, but by knowing these manners, you will be able to enjoy the tea ceremony much more than not knowing at all. Sadou treasures the spirit of both the host and the guests to enjoy not only the flavor of the tea, but to enjoy the whole atmosphere of the ceremony. Next, we would like to introduce the tea house in Hama Rikyu, where you can experience the actual tea ceremony. The wonderful view of the Japanese garden and the fabulous taste of the tea cake and tea will make you want to know more about the world of Sadou.